Dinosaur exhibits for schools and museums. 40 framed oil paintings (Giclee Canvas). 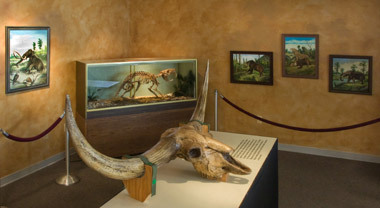 The exhibit includes land and sea creatures, dinosaurs and ice age animals from all 12 prehistoric periods, from Precambrian through Quaternary . Description: "Dinosaur Exhibit of Prehistoric World Images" by The World Legendary Paleo-Artist Josef Moravec. Prepare to embark on a visual journey across billions of years in the evolution of earth science. The exhibit of 40 stunningly beautiful and finely detailed oil paintings "Giclee Canvas" showing land and sea creatures, dinosaurs and ice age animals from all 12 prehistoric periods. From Precambrian 4.6 billion years ago to the Pleistocene Epoch 20,000 years ago. Prehistoric trilobites from Cambrian and Ordovician, sharks from Devonian, Permian and Jurassic reptiles, Mesozoic dinosaurs such as Tyrannosaurus rex, Triceratops, Parasaurolophus, Tarbosaurus, Ceratosaurus, Stegosaurus, Anatosaurus, Carnotaurus, Dilophosaurus, Diplodocus, Brachiosaurus, Allosauruses and prehistoric animals such as Brontotherium from Oligocene and Columbian Mammoth, American Lion and Saber Tooth Cat. Josef Moravec's original oil paintings are considered to be a treasure of Czech Republic. The exhibit is now available to museums, schools, discovery centers and libraries. Also available to exhibitors (at wholesale prices) are photographic quality prints, T-shirts, sweatshirts, hats, note cards, posters, mouse pads, mugs, etc. 20 framed oil paintings (Giclee Canvas). The exhibit is now available to museums, schools, discovery centers and libraries. The exhibit is now available to museums, schools, discovery centers and libraries. Dinosaur Corporation can customize an exhibit for your educational venue from Precambrian to Pleistocene. Also available to exhibitors at wholesale prices are high quality reproductions on Giclee Canvas, photographs, T-shirts, sweatshirts, hats, note cards, posters, mouse pads, mugs, etc. We suggest that your museum gift shop offer this unique merchandise to your visitors, especially during your exhibition of Prehistoric World Images. For more information on this unique traveling exhibit contact us.